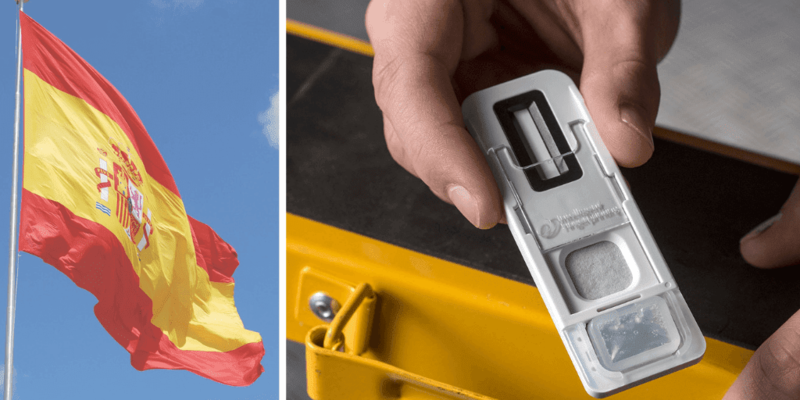 The world’s first portable fingerprint-based drug test – which works by analysing sweat from a fingerprint to determine if someone has recently used cocaine, opiates, amphetamines or cannabis – will bring new levels of convenience, hygiene and speed to the drug rehabilitation testing market in Italy. A video showing the revolutionary Intelligent Fingerprinting fingerprint-based drug testing in action is available here. Lazio-based drugs of abuse testing specialist Di.RA.LAB will host a seminar on 8 June at the Mercure Hotel, Fiumicino, Italy, from 09.30 to 13.00, where it will join with Intelligent Fingerprinting – developers of the revolutionary fingerprint-based drug test – to showcase the technology for the first time in Italy. Targeted at a specialist audience, including drug rehabilitation and law enforcement, the seminar will cover both the science behind fingerprint-based drug testing as well as a practical demonstration of the technology in action. 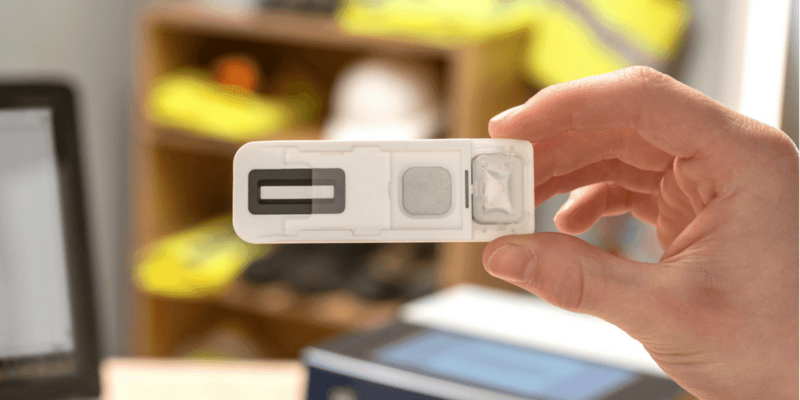 The Intelligent Fingerprinting solution is the industry’s only end-to-end drug testing solution based on fingerprint sweat analysis, and is the result of several years of intense R&D and €13.5 million in development funding. 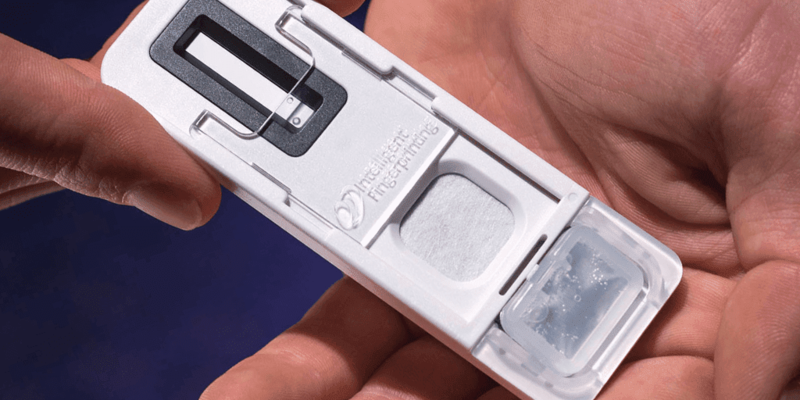 The solution features a Drug Screening Cartridge that detects specific drugs or their metabolites in the sweat collected from a fingerprint; the highly sensitive and robust Reader 1000 which provides a positive or negative result for each drug in the test within just eight minutes; and a Fingerprint Collection Kit for Laboratory Analysis (if a laboratory confirmation test is required). The system is particularly quick and easy-to-use, while its non-invasive and hygienic nature makes it an ideal solution for rehabilitation drug testing scenarios. To find out more about the Intelligent Fingerprinting technology and its applicability across a range of markets, please get in touch to attend the June 8 Di.RA.LAB / Intelligent Fingerprinting seminar in Fiumicino, Italy. Should an individual’s initial screen prove positive for any of the four drugs tested, the drug test administrator can collect fingerprint samples for laboratory confirmation using the new Intelligent Fingerprinting Fingerprint Collection Kit for Laboratory Analysis. Once the confirmatory samples have been collected, the Fingerprint Collection Cartridges are sent in a tamper-evident security bag for analysis. Based in Fiumicino near Rome, Di.RA.LAB S.r.l. is a leading supplier of products and services associated with the diagnosis of the use of substances of abuse such as drugs and alcohol. Di.RA.LAB is an acknowledged innovator, and offers a broad range of single and multiple drug and alcohol tests that not only deliver the highest levels of accuracy but also support current legal and compliance guidelines across a number of sectors. Di.RA.LAB works closely with a range of organisations including Local Health Authorities, the Military Police, the Italian Army, Navy and Air Force, the Italian Interior Ministry as well as a number of private Occupational Medicine laboratories. The system is currently being marketed to the criminal justice arena, drug rehabilitation services, offender management, workplace and occupational health services. The technique has potential for many other uses including healthcare diagnostics and homeland security applications. Founded in 2007, Intelligent Fingerprinting is a spin-out company from the University of East Anglia (UEA). The company is based in Cambridge, England and currently employs around 30 people.